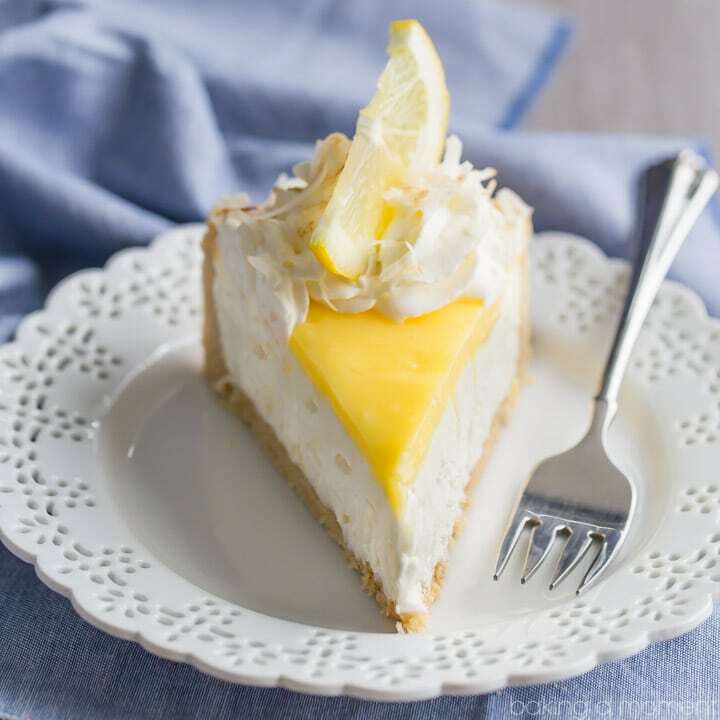 This No-Bake Lemon Macaroon Cheesecake will be the hit of your summer party! 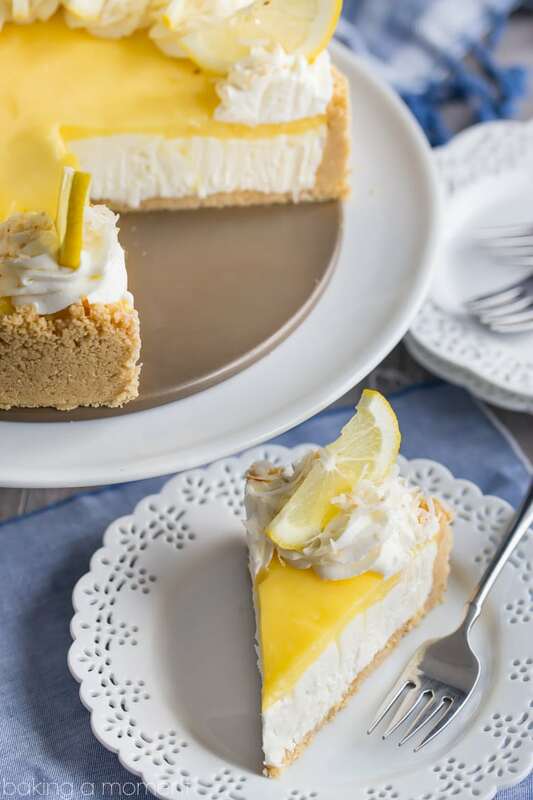 Crunchy vanilla cookie crust, creamy coconut cheesecake, and tangy lemon curd come together beautifully and simply. Be sure to scroll all the way to the bottom of the post for a special giveaway! Hey guys! I’m really pumped to bring you this post today because a) did you see that stunner of a cheesecake up there? It tastes even better than it looks! And b) it’s all about my good friend Julianne’s new book! No-Bake Treats has over 80 mouthwatering recipes and it costs less than $15. You can get it on Amazon, Barnes & Noble, Indie Bound, Books-A-Million, or wherever books are sold. I was lucky enough to get a couple advance copies (more on that later) and I couldn’t be more impressed. Each one of the recipes is more tempting than the last. 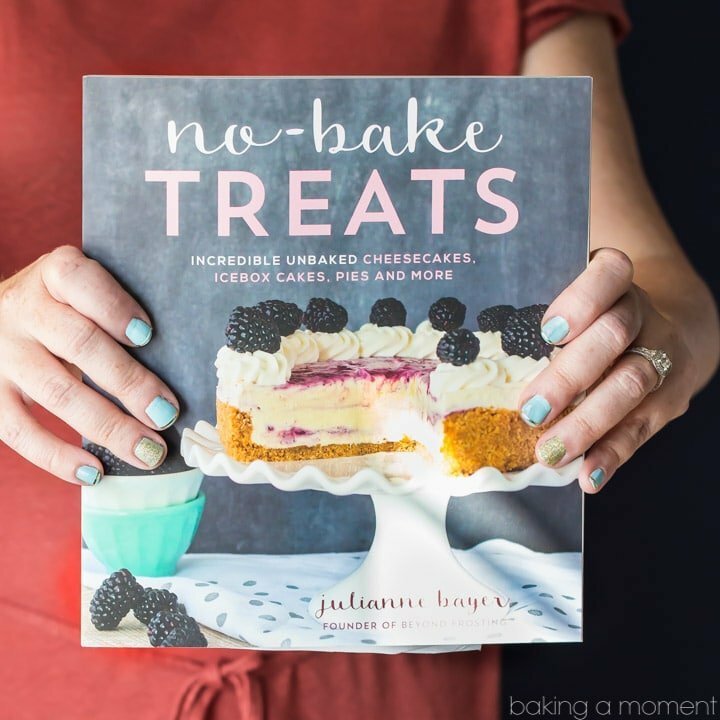 If you know Julianne’s blog, Beyond Frosting, then you can expect the same kind of deliciousness from this cookbook. All the recipes are gorgeous, and super-simple to make. And the best part? 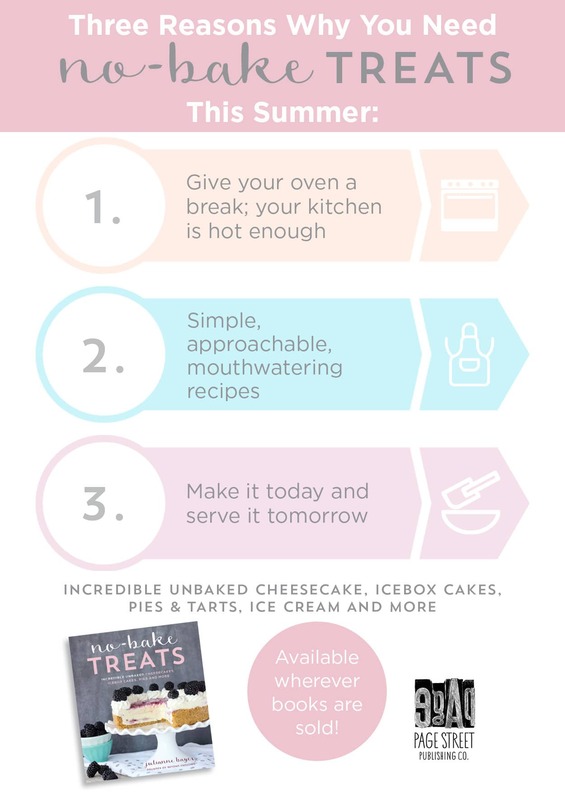 You don’t have to turn your oven on for a single one! It’s so perfect for this time of year. I had so many incredible options to choose from for this post, but I settled on this recipe because I love lemon so much, and I thought you would too! Can you even get over that glorious creation??? That’s Julianne for you. She has the most incredible knack for putting amazing flavors together and making them beautiful and effortless. Plus she’s one of the sweetest people I’ve ever known. Just sayin’. But let’s stick to lemon macaroon cheesecake here. This dessert tasted even better than I anticipated. First of all, Golden Oreos? Where have these been all my life. I actually know these have been around for quite some time, but I tend to be a bit of a purist (and a chocoholic) so I have never before had the pleasure. Now I really need to make up for lost time because these things are amazing. Even better when crushed and tossed with melted butter. Over the crunchy vanilla cookie crust goes a layer of coconut cheesecake. It’s simple as can be with only 4 ingredients (and no baking, obvs). I have to admit, there was a part of me that thought I should add a few extra ingredients, like vanilla or coconut extract or a pinch of salt, but this was a lesson to me. Simple is often best. It doesn’t need another single thing. Especially when you top it off with a thick layer of lemon curd. Julianne says you can go ahead and use the store-bought kind, but I jumped at the chance to use my homemade version because I love it so much. Truly, there is no comparison. In my recipe, the tart lemony-ness is off the charts, and it has the most incredibly buttery backnote. It’s definitely worth the 10 minutes it takes to whip it up! Julianne likes to cover hers with a thick layer of whipped cream all over the top, but I just couldn’t bear to cover up the gorgeousness of that lemon curd. (Julianne, I hope you don’t mind that I did mine a little differently!) So I halved the quantities on the topping (recipe below reflects Julianne’s original), and just gave it a tall border of whipped cream swirls using this kind of piping bag and this tip. Then, just sprinkle with toasted coconut and garnish with lemon slices. 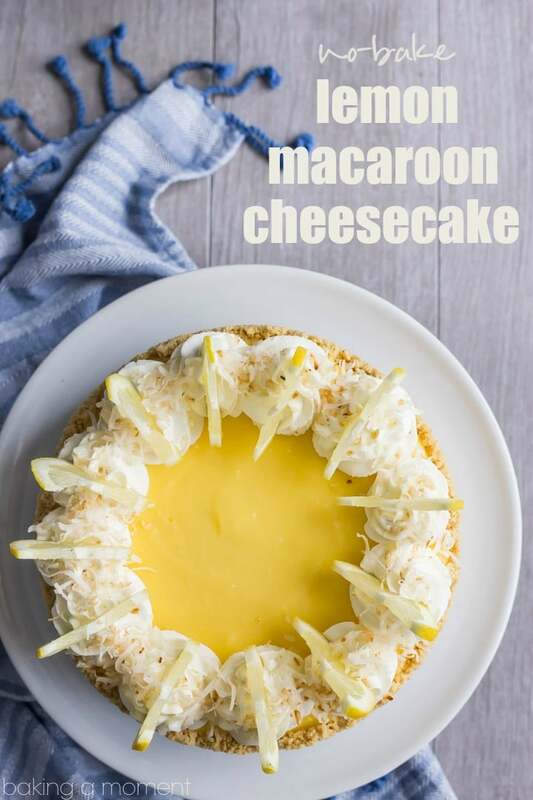 This No-Bake Lemon Macaroon Cheesecake will be the hit of your summer party! 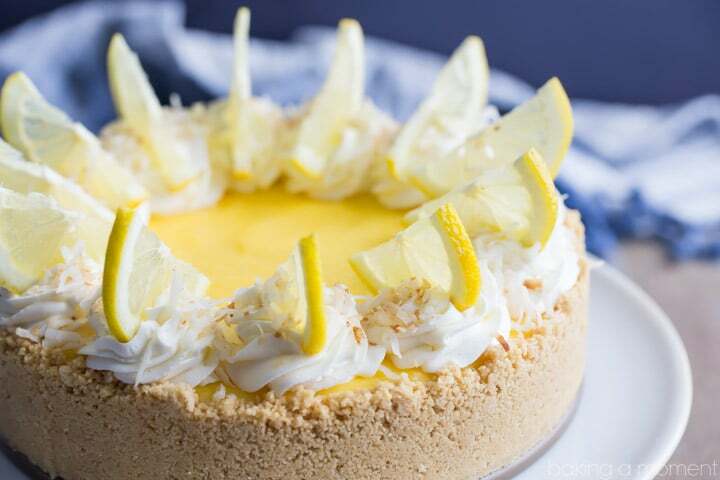 Crunchy vanilla cookie crust, creamy coconut cheesecake, and tangy lemon curd come together beautifully and simply. Lightly mist a 9-inch springform pan with non-stick spray. Grind the cookies into fine crumbs using a food processor or blender. Pour the melted butter into the cookie crumbs and stir until there are no dry crumbs left. Pour the crumbs into the prepared pan and press firmly into the bottom and up the sides of the pan to create a thick crust. Beat the softened cream cheese on medium-high speed for 2 to 3 minutes until it's light and fluffy. Slowly add the sugar into the cream cheese and continue beating until the suar is incorporated, scraping the bowl as needed. Add the melted white chocolate and shredded coconut, and beat the mixture at a high speed for 60 to 90 seconds to create a nice and airy filling. Pour the cheesecake filling into the prepared crust and spread evenly with a spatula. Spread the lemon curd over the cheesecake layer. Place the mixing bowl and whisk attachment in the freezer for 5 to 10 minutes to chill. Pour the heavy whipping cream into the chilled bowl and use an electric mixer to beat the heavy cream on medium-high speed until the cream gets bubbly. Slowly add the powdered sugar and continue beating on high speed until stiff peaks form. Add a nice thick layer of whipped cream atop the cheesecake. Toast the coconut for a few minutes in a dry skillet, stirring constantly until lightly browned. Sprinkle toasted coconut on the cheesecake to garnish. Cover with foil and refrigerate for 4 to 6 hours to allow to set. WOW!!!! This is so gorgeous!! I love that you didn’t cover up the lemon curd and I love that you did it homemade! Thank you so much for sharing!! I’m so glad you’re happy with it Julianne! It’s such a terrific recipe and I wish you all the success in the world with your fabulous book! Thank you so much Medha! I really loved it too! I love a good no bake cheesecake for summer gatherings! This one is gorgeous! So easy right? And always a crowd-pleaser. Thanks so much Jessica! Hope you’re having a great weekend! This looks delicious. I have a question, do you use the whole cookie, or remove the filling and use just the wafer? I WILL be making this for an upcoming family reunion. Maybe two, one with homemade raspberry curd. Thanks for the recipe. I LOVE the raspberry curd idea! Sounds so delicious! I just used the whole cookie, filling and all, and it worked out just fine. Hope that’s helpful! Enjoy Diane! Thank you so much Beverley! I’m so happy you liked this recipe!